The Backwoods Engineer: Take That, Feinstein, You Wicked Witch! 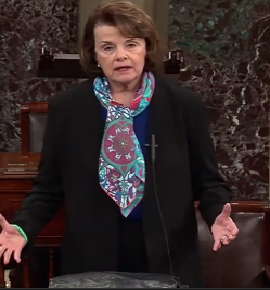 Senator Frankenwitch Feinstein's gun grab goes down in a hail of votes. Ding dong, the wicked witch's bill is dead. WASHINGTON -- Democrats helped Senate Republicans defeat major reforms to reduce gun violence Wednesday, including bans on certain assault weapons and high-capacity magazines. An amendment, put forth by Sen. Dianne Feinstein (D-Calif.), to re-establish a federal ban on certain assault weapons was defeated by a vote of 40-60. A near-united Republican conference voted against the measure, with just one GOP senator, Mark Kirk (Ill.), voting in its favor. Fifteen Democrats voted no on an assault weapons ban: Sens. Max Baucus (Mont. ), Mark Begich (Alaska), Michael Bennet (Colo.), Joe Donnelly (Ind. ), Kay Hagan (N.C.), Martin Heinrich (N.M.), Heidi Heitkamp (N.D.), Tim Johnson (S.D. ), Mary Landrieu (La. ), Joe Manchin (W.Va.), Mark Pryor (Ark. ), Jon Tester (Mont. ), Mark Udall (Colo.), Tom Udall (N.M.), and Mark Warner (Va.). Sen. Angus King (Maine), an independent who caucuses with the Democrats, also voted against the ban. A separate amendment introduced by Sens. Frank Lautenberg (D-N.J.) and Richard Blumenthal (D-Conn.) to limit the size of magazines to 10 rounds failed with a vote of 46-54. Kirk was again the only Republican to vote for the measure. Now, on to the next fight.